Paleontologists have found dinosaur footprints in places where you wouldn’t expect them—in the frigid Arctic Circle, along the Yukon and Tanana rivers. It’s an amazing find, something scientists have never seen before in Alaska. The tracks numbered in the thousands. The tracks were from large and small dinosaurs and they were formed after the creatures stepped in squelchy mud and sand filled in the gaping prints. In July, scientists from the University of Alaska Museum Of The North trekked 500 miles down the Tanana and Yukon Rivers, and they were astounded by the abundance. Over the last decade, scientists have poured endless hours searching for traces of Alaskan dinosaurs and this patience has paid off. The first footprints were discovered in 2005 in Denali National Park and the tracks dated back to the late Cretaceous period between 65 million to 85 million years ago. McCarthy said these newly discovered tracks may date back an additional 25 million to 30 million years earlier. Hundreds of footprints of both dinosaurs and birds have been discovered since then, but this recent find was truly a treasure trove. “In contrast, the tracks were so abundant along the Yukon River that we could find and collect as many as 50 specimens in as little as ten minutes,” McCarthy said in the statement. Such a large find is rare today, said Pat Druckenmiller, the Museum’s earth sciences curator. During the time when these remarkable creatures lived, Alaska’s climate was warmer, but still cold, falling somewhere between Portland, Oregon and Calgary, Alberta, Canada. It definitely wasn’t the tropical climate we sometimes associate dinosaurs with. Pachyrhinosaurus perotorum was one such dinosaur that called Alaska home. 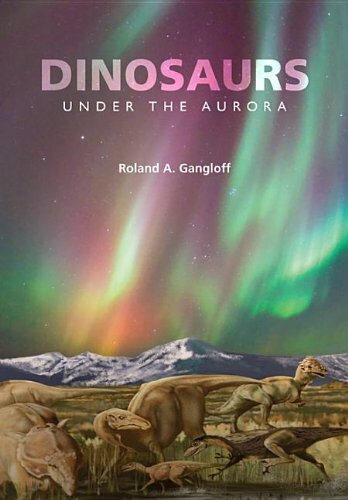 The ground on which this strange dinosaur walked was much closer to the North Pole and it as well as the other creatures that lived there experienced greatly fluctuating extremes of light and dark. The discovery of this species of Pachyrhinosaur happened on a wet, cold, dreary and miserable day. The kind of day when you hope you find something that makes it worth the trouble. That’s how it was for Tony Fiorillo, clinging to a soggy hillside and fighting pneumonia. Carefully digging the soil with a trowel, he noticed an odd lump sticking out of the soil so he picked up a brush and gently whisked dirt away. In a short while, the outline of a skull became apparent and suddenly the day didn’t seem so dreary. The light of discovery had definitely brightened this day. Fiorillo knew he was on to something. Fiorillo, who works with the Museum of Nature and Science in Dallas, Texas, knew his find was remarkable. It was one of the rare specimens found to be intact enough to be a museum-quality display. This was heartening news, since the Museum was planning a new building. He and McCarthy carefully unearthed the skull and coated it with plaster. Fiorillo didn’t know they were handling a species of Pachyrhinosaurus that was new to science. Transportation was a several step process, and the fossil, still embedded in a large chunk of rock made its way to the Museum in Texas. There it took fossil-preparer Ron Tykoski five years to carve and chip the rock apart. In so doing, he could see that the rock contained the fossils of many dinosaurs. “It’s as if someone took 15 Pachyrhinosaurs, dumped them into a blender for 30 seconds, poured all the mess out into a ball of concrete, then let it solidify for 70 million years,” Tykoski said. Once his work was done, Tykoski and Fiorillo noticed the skull had several features that distinguished it from similar dinosaurs and that no one had documented this animal before. Both paleontologists presented the evidence for this new to science dinosaur at a meeting of fellow paleontologists in Las Vegas. In life, P. perotorum had a huge bony crest that boasted horns on each side and a huge parrot-like beak that suited its herbivorous habits. Like other Pachyrhinosaurs, it boasted a large nasal boss (bony lump) atop its snout. Some members of this species grew as large as 26 feet long and weighed about four tons. At least three species of pachyrhinosaurs, including P. perotorum, have been found in Canada and Alaska. P.perotorum roamed Alaska 70 million years ago, lumbering through the ferns and nipping vegetation, prowling perhaps along the same riverbanks where its fellow dinosaurs left their tracks. One thing is now certain. We think of dinosaurs as creatures that lived in the tropics, but quite obviously for many species, the cold didn’t faze them one bit. Creatures long dead are now being brought out into the light. Once upon a very long time ago, these magnificent creatures were full of life in a vibrant world that is different, and yet, the same.